This pumpkin weighed 88 lbs excluding molly. 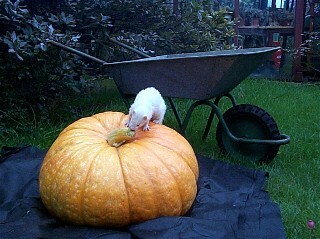 At the local pet shop there was for sale several ferrets until there was just one left, a small albino Jill ferret. I was told that she had a tendency to nip but undeterred I picked her up and found she was no trouble. Time passed and I saw that the price had been reduced, so I bought her and the cage. I was told she was unsold because people disliked her red eyes, but also in my view the sign attached to the cage warning that ferrets bite may also been a reason. Dad named her Molly and I also liked the name, she was a bundle of energy, watching her playing with a ball or darting about and hiding behind the washing machine was so funny. Molly did not like to mix with other ferrets, so she was always kept and exercised alone. 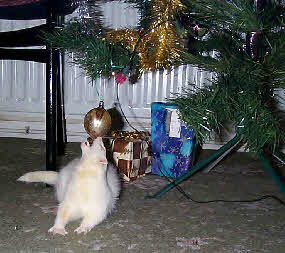 She was the first jill ferret I owned and lived for an estimated six years. She developed heart problems in old age and was kept going by medication; the day she died symptoms similar to a stroke, such as partial paralysis was noticed. With Jill ferrets, unless there is a desire to breed, a responsible owner will opt for spaying at a veterinarian’s, as was done with Molly. Spaying stops the the reproductive clock and is permanent. Alternatively, a yearly hormone injection known as a Jill-jab or a mating with a vasectomised Hob ferret is desirable each year a litter of ferrets is unwanted.